Nations Press feature MISS UNIVERSITY OF MINDANAO 2016 CAUGHT THE ATTENTION OF NETIZENS BY HER Q and A ANSWER! Read Here Now!! MISS UNIVERSITY OF MINDANAO 2016 CAUGHT THE ATTENTION OF NETIZENS BY HER Q and A ANSWER! Read Here Now!! SPONSORED LINKS Miss University Of Mindanao 2016 garnered by Rhea Dilangalen 20 year old and taking up Degree In Accountancy. Miss Rhea was crowned because of her answer in the said pageant the Q and A portion, and that made her the trending topic online. 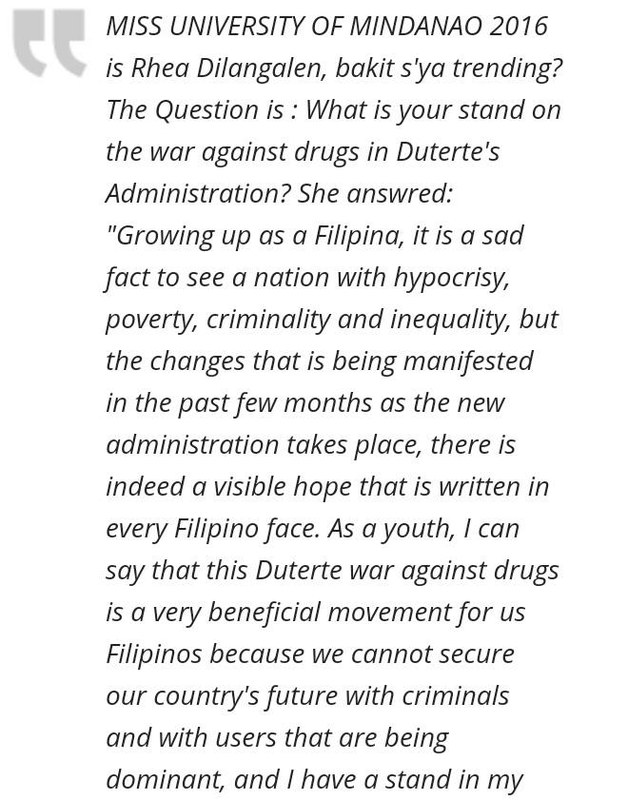 Mostly the President Supporters amazed the way she answered the question, as she give her positive insight as a youth regarding the drug campaign of the government. The question that made her win was: "What Is Your Stand On The war against Drugs Of Duterte's Admnistration?